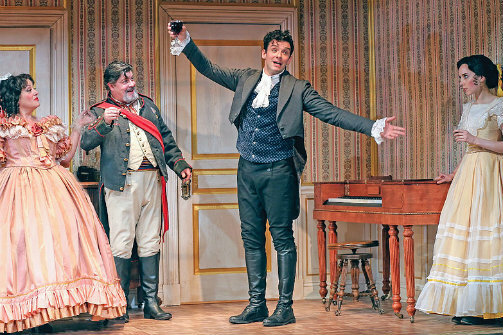 Mary Testa, Michael McGrath, Michael Urie, and Talene Monahon in The Government Inspector. Photo by Carol Rosegg. BOTTOM LINE: A new adaptation of a Russian classic makes for a refreshingly mindless comedy with an amazing cast that will have you rolling in the aisles. The Government Inspector is adapted from a play by the great Russian playwright Nikolai Gogol. But don’t let that intimidate you. We’re not dealing with high-falutin’ art here, but a hilarious Vaudevillian entertainment that manages to amuse for an entire two hours. The play is filled with all of the recognizable shenanigans of mistaken identity, double entendre, and hilarious slapstick comedy—enough to impress the Three Stooges and the Marx Brothers. Set in a provincial Russian town in 1836, the premise is simple. The Czar has sent a government inspector to a corrupt and backwards little town to evaluate its schools, hospitals, and courthouses. Word of the inspector’s arrival sends the crooked mayor (Michael McGrath) into a frenzy of panic as he gathers all of his officials and concocts a plot to bribe, wine, dine, and shamelessly grovel for the mercy of the inspector’s judgment. The only problem is that Ivan Hlestakov (Michael Urie), some ne’er-do-well loafer intent on eluding his creditors, is inexplicably mistaken for the government inspector. In their first scene together, the hilarious McGrath and Urie try to out-grovel each other, thinking that they are each at the mercy of the other. Confusion over who should pay a bribe to who, an exchange that results in Hlestakov becoming the mayor’s houseguest where he gains access to the mayor’s liquor, wife (Mary Testa), and daughter (Talene Monahon), is reminiscent of the classic misunderstandings of comedy duos like Abbott and Costello and Laurel and Hardy. The chemistry and timing between Urie and McGrath is perfect, and if the year were 1910, I’d suggest booking these two on the Orpheum Circuit. Under the impeccable direction of Jesse Berger, there are too many notable performances in this fourteen-member ensemble to mention them all. But highlights include Mary Testa, who lights up the stage with her brash chutzpa; Michael McGrath, whose loud desperation recalls the hilarious bellows of Jackie Gleason; and Michael Urie, who turns in a star-making performance by showing a knack for physical comedy that rivals John Ritter’s in Three’s Company. While Urie is already recognizable to television (and Off Broadway) audiences, he proves here that he should be headlining comedies on Broadway. And Burton’s performance is so masterful that until I started writing this review, I didn’t realize the same actor plays both the inspector's servant and the town’s ridiculous Postmaster who makes a habit of opening everyone’s mail before delivering it. Alexis Distler’s imposing two-level set design supports the play’s farcical chases and creates the perfect playground for the madcap action. The top level has its own traveler curtain, and the bottom level is split in half with a curtain for each side, a three-quadrant design that makes the stage feel as playful as a puppet show. Tilly Grimes’ extravagant costume design helps define every character and gives each actor a strong foundation on which to build. It’s tempting to take The Government Inspector as a comment on the corrupt and farcical state of our country right now. But why weigh down a light and enjoyable evening with pretensions towards political statements? Suffice it to say that what we have here is just a wholesome, family-friendly, good ‘ole time. Enjoy it. 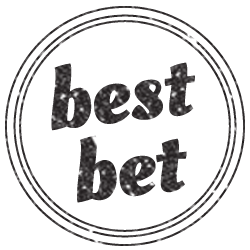 How often does Off Broadway offer up an innocuous comedy with no agenda other than to make your belly ache with laughter? The Government Inspector is adapted by Jeffery Hatcher, based on Revizor by Nikolai Gogol. Directed by Jesse Berger. Set Design is by Alexis Distler. Costume Design is by Tilly Grimes. Lighting Design is by Megan Lang and Peter West. Sound Design and original music is by Greg Pliska. Hair and Wig Design is by Dave Bova. Fight Director is J. David Brimmer. Stage Manager is Hannah Woodward. The cast is Arnie Burton, Stephen DeRosa, Ryan Garbayo, Kelly Hutchinson, David Manis, Michael McGrath, Ben Mehl, Talene Monahon, Luis Moreno, James Rana, Tom Alan Robbins, Mary Lou Rosato, Mary Testa, and Michael Urie.